Delfield AS000-B3P-DT4 Stainless Steel Double Overshelf - 72" x 16"
Thanks to its innovative front-breathing design, the Delfield 4472N-30M mega top sandwich / salad prep refrigerator can be pushed flush against a wall, or built into a cabinet or counter, to help conserve valuable space in your busy kitchen, deli, or pizzeria. The ingredient rail can hold up to (30) 1/6 size food pans (included), so you'll always have the toppings you need close at hand. Additionally, an 8" wide, antimicrobially treated polyethylene cutting board provides ample space to prepare delicious sandwiches, salads, and subs piled high with fresh meats, colorful toppings, and savory sauces. Three epoxy-coated wire shelves help you organize back-up and bulk ingredients in the prep refrigerator's lower cabinet. 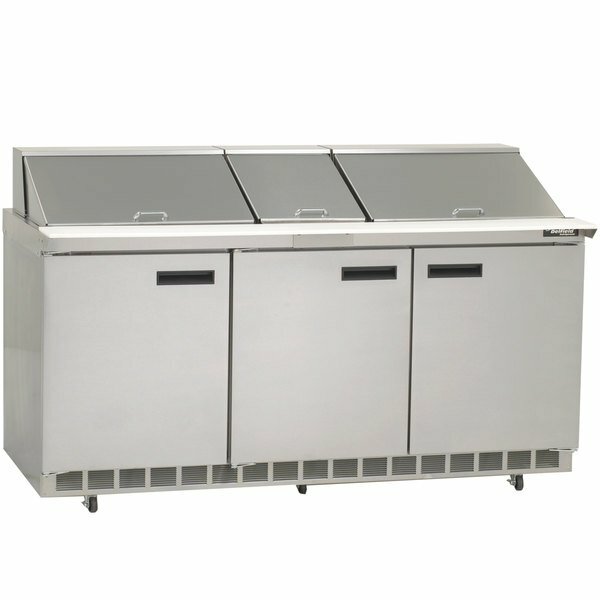 This sandwich / salad prep refrigerator is powered by a 1/2 hp compressor and maintains temperatures between 36 and 40 degrees Fahrenheit. It requires a 115V electrical connection. I made this purchase back in 2013 and it is still in perfect condition now! I absolutely love this prep table! It is the perfect size. I personally own 2 of them to make my kitchen have a bigger line so that means more business faster! Great Price and great product. I was even able to specify what kind of top on the unit. Came fast and problem free. Will definitely order this way again. This Brand is Heavy Duty, pulls temps down fast and holds it there! We work with the tops open for hours and the products stay cold because of the design of cold air blowing across the top of the pans as well as the bottom. Front breathing helps you squeeze out all the room on our line. Great customer service, great price, great brand and great unit! Will definetly shop here again!